The Grambling football players' decision not to travel for Saturday's game left its opponent in a lurch. 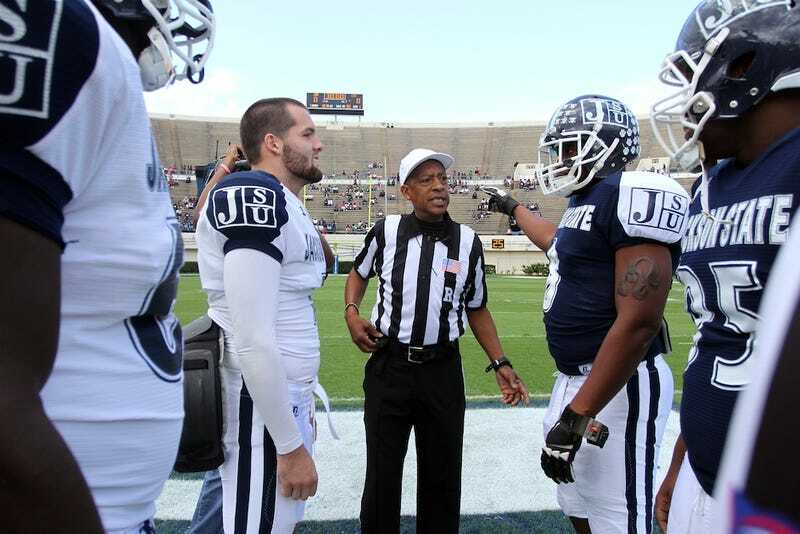 It was homecoming for Jackson State, which earned a forfeit win but suddenly had less than 24 hours to come up with some alternative programming for all those returning alumni. Jackson State ended up playing an intrasquad scrimmage (Jackson State won! ), but it claims the school and the city of Jackson, Miss., took a financial hit that "could be in the millions" because of the canceled game. So now Jackson State says it intends to sue Grambling. The Jackson State University community experienced an unprecedented event during our Homecoming Week. The cancellation of the football game was disappointing for faculty, staff, students, alumni and supporters. Yet we did not allow it to diminish our tradition of coming together and celebrating the university's history and legacy. Thank you for your assistance and patience for making this Homecoming like no other. The Charlie Wilson concert was sold out, with some revelers dancing in the aisles. The Greek Show was well attended. Our Gibbs-Green Pedestrian Walkway was packed with alumni and students with their families. This was a testament to the strong spirit of those who refused to let another institution's challenges dampen JSU's Homecoming. Still, the JSU family was damaged. Our Homecoming game draws tens of thousands of fans. The university intends to use litigation to be made whole for our direct and indirect financial losses. We have a fiduciary responsibility to Mississippi taxpayers and the JSU community to mitigate our ongoing and substantial losses. Jackson State plans to pursue litigation against Grambling State and others. Grambling's issues are well documented and long standing. Those issues, however, are not JSU's issues nor are these JSU's responsibility. Grambling repeatedly assured us its team would travel to Jackson. Late Friday afternoon they informed us their student athletes would not travel to Jackson for our scheduled game. We have dealt in good faith with Grambling and the Southwestern Athletic Conference. The actions of both have hurt JSU. The SWAC commissioner did not return calls from our director of athletics the entire week. The Clarion-Ledger reported the SWAC commissioner would be meeting with folks at Grambling and JSU. We haven't seen him, nor has he called. Jackson State University's and the city of Jackson's losses could be in the millions. It would be irresponsible for JSU to fail to pursue some redress. Given Grambling's dire financial situation, it's not clear how much Jackson State stands to gain by filing suit. According to Sports Illustrated, Grambling's football program has been running a deficit of between $1.2 and $1.8 million in recent years, and its athletic budget is expected to be slashed by another $1 million next year.